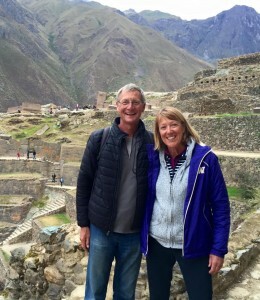 Dave and Denise Mickelson of Bellevue tour the Inca Ollantaytambo ruins in southern Peru. Whether you dream of walking the steps of Machu Picchu, exploring the Galápagos Islands or becoming a winemaker in Bordeaux, fulfilling your bucket list is easier when your body is healthy enough to cooperate. When to Invest in Your Health? NOW! You only have this one body that needs to get you through all the years of your life. So the time to start getting your spine and body healthy is right now, especially if you’re not retired yet and want to be able to look forward to making your burgeoning bucket list a reality. “Dr. Cummins and I have 3 kids three and under, so we’re not traveling much now. Our goal, however, is to see some wonderful, far-off places that are on our bucket list. We each only have this our set of knees and one back, and we want them to be in good shape so we can travel when we’re 66, 76 and 86,” says Anna Cummins, Dr. Cummins’ wife and Olympic Champion. Inspired by Anna’s parents, Dave and Denise Mickelson of Bellevue who partake in regular chiropractic wellness care, the Cummins family has a family legacy to fulfill. The Mickelsons recently returned from six weeks traveling South America, visiting many of the places they originally explored 40 years ago after serving in the Peace Corps. One of their favorites they reported was a week long stay in the Galapagos Islands. Each day was spent doing two hikes and two snorkel swims for the entire week. Endurance and good structure were a must to maximize their adventure. If you were told you only get one car to last a lifetime, you would likely change the oil religiously and keep the car in tip-top shape. With cars, of course, you can get a new one whenever the mood strikes. Not so with your one-and-only body. Getting regular chiropractic checkups can help you maintain better overall health. It’s much better to look at that bucket list with great anticipation versus great disappointment if deteriorating health is an impediment to your dreams.